A barrette with metal clasp to easily and quickly accessorize your hairstyle. Pearly with unique reflections, it will adapt to all your outfits: beach, sports, city or evening. Handcrafted, each model is unique in its color, reflections and Polynesian motives. Since millennium, the warm waters of Polynesian lagoons are home for a marvel: the pearl oyster or "Pinctada margaritifera". Coming from a pure and exceptional lagoon, this unique mother-of-pearl can have incomparable and natural hues. The cultured pearl born from these mother-of-pearls have also unique hues and are known as real gems. 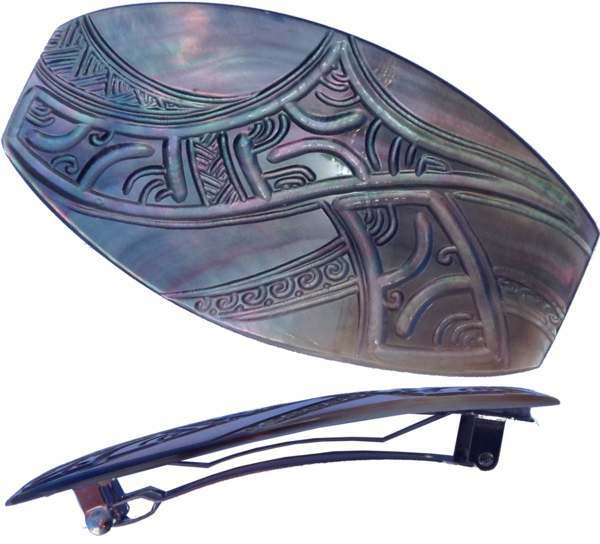 The Polynesians have always used the mother-of-pearl. They once had a utility value (tools, fishing lures, hooks, graters, scrapers, spoons, spatulas…) but also a decorative and ornamental value as costumes and ceremonial objects. Thus the old ornaments were adorned with large pearls polished with intense glare, which added to the majesty of the person who was wearing. During their history, mother-of-pearls have always been interested humans not for the pearls they might contain, but for the exceptional beauty of their shells. Today, the cultured black pearl of Tahiti became a symbol of elegance and beauty in the world. Although only 25 to 30% of mother-of-pearls give birth to a marketable pearl and mother-of-pearls are very popular. They are used for the manufacture of jewelry or luxury, or for the manufacture of traditional costumes. Mother-of-pearl possesses particular reflections which hang on the light. The typically Polynesian artistic motives make reference to the omnipresent ancestral culture in the everyday life. Often abstracted for the greenhorns, they are loaded with symbols and meanings.